I've been really enjoying chia lately, as you know. 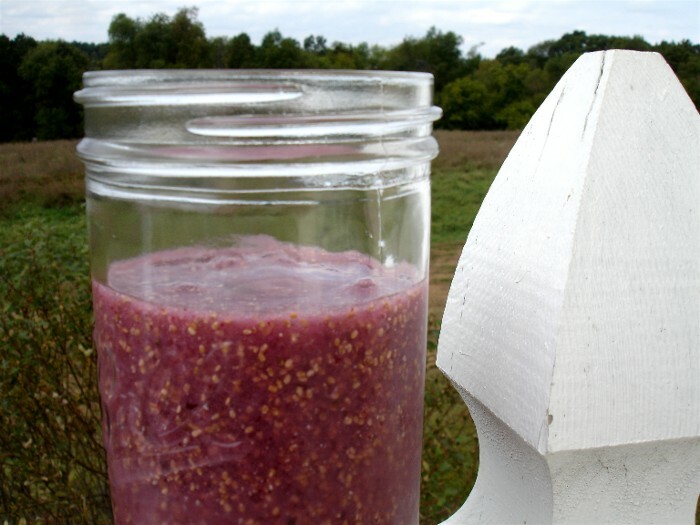 Natural Remi -Teas sent some white chia seeds recently as well as some wonderfully fragrant white tea, and this smoothie is what I made with them. I really like the prices at Natural Remi - Teas. The white chia is just $5.50 a pound. Tea steeped in boiling water isn't raw, and I avoid pretty much all caffeine myself, but plain water worked really well for this, too. 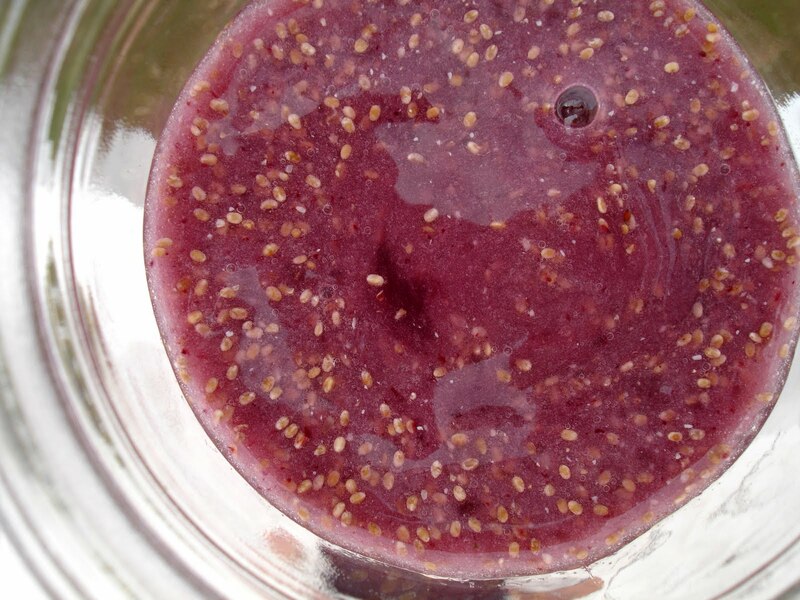 In a blender, soak the chia seeds in the cooled tea or water for about twenty minutes. Add the remaining ingredients and process until smooth and chilled. I don't like blackberry seeds, they drive me crazy, so I strain the blackberry puree through a wire mesh strainer. Save a few tablespoons of the blackberry puree for dessert later. Oh. Yeah. Coconut butter is divine. Artisana makes organic, raw and vegan nut butters and coconut products. 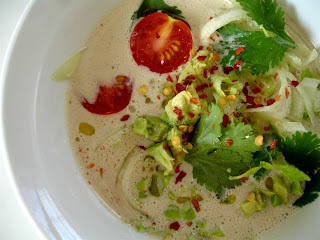 They provided some of their coconut butter and nuts butters for me to try, which are great straight from the jar and worked out really well in this easy and convenient soup. In a blender, process the coconut butter, cashew butter (almond butter will work as well), water, dates, cilantro, garlic, red pepper flakes, cayenne, lime juice, salt and pepper. Puree until as smooth as possible. 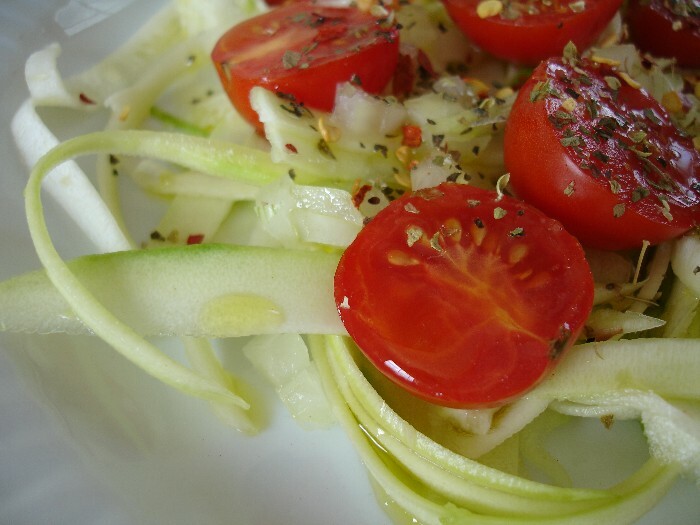 Cut the cucumber into noodles and put in bowls with the avocado, celery, cilantro, and cherry tomatoes. Using a wire mesh strainer, strain the coconut and nut butter soup base. This will take out any larger pieces of dates or spices. A higher powered blender may make this step unnecessary. Add a sprinkle of red pepper flakes. This is just a very basic zucchini noodle recipe. 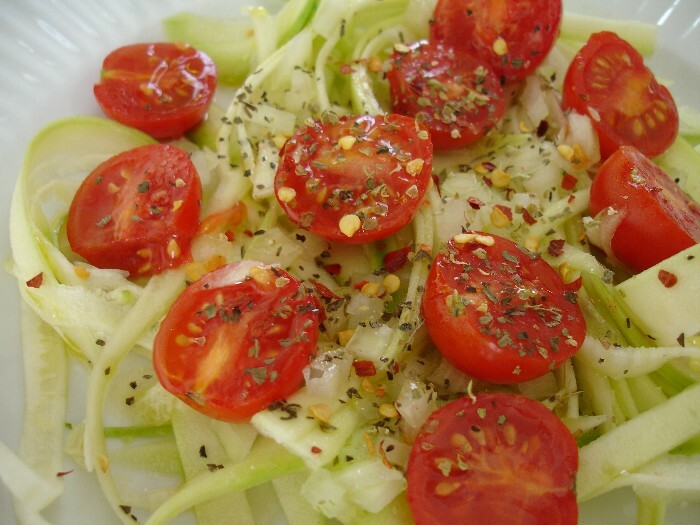 Use a vegetable peeler or spiral slicer to cut the zucchini into noodles. Another option is to simply grate the zucchini. 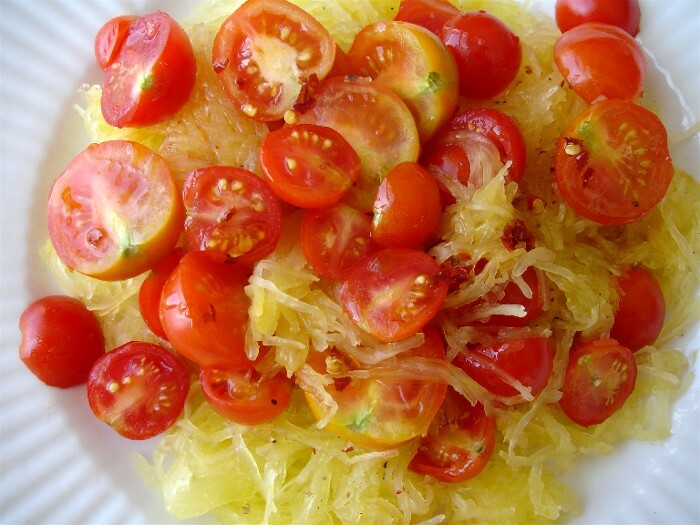 Top with cherry tomatoes and olive oil, and add salt, pepper, and red pepper flakes to taste. 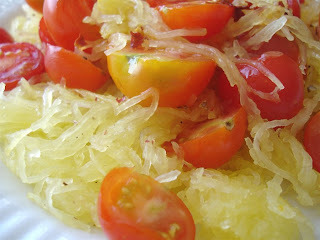 It's not raw, I know, but I wanted to show you these amazing spaghetti squash noodles. 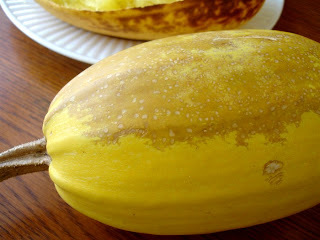 Spaghetti squash grows very easily from seed, even where there are short growing seasons. I was surprised at how easy and prolific they are. After being cured, they can be stored for several months. They are commonly available at most grocery stores as well. I'm really pleased with how well these grew and now have a pantry full. It's really not possible, as far as I know, to eat these raw. So, I've made them cooked. Done in the oven at 350, the inside will not get any hotter than 212 degrees, so they are basically steamed. To prepare, simply place the squash on a baking sheet in the oven at 350 degrees for an hour and twenty minutes. Remove from oven, let cool slightly, then cut in half. Remove the seeds with a spoon. 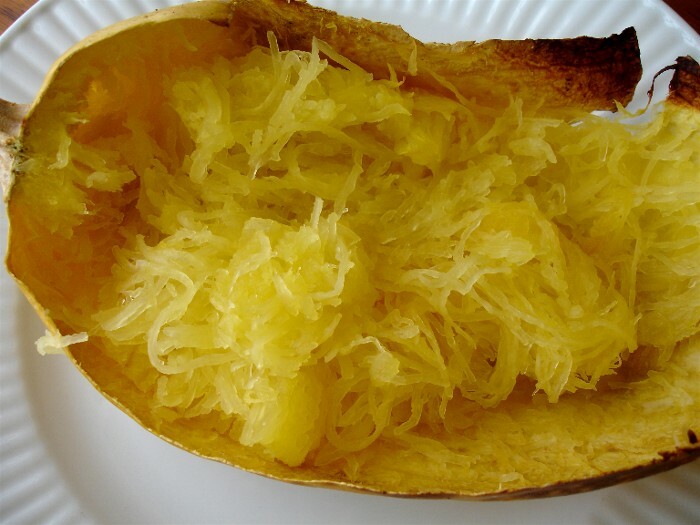 Then, using a fork, scrape the squash flesh. It will come apart in noodle shaped strands ... and it makes a lot. These strands can be used like any vegetable or grain pasta. Here, I've added the same things as I have to the zucchini noodles above. 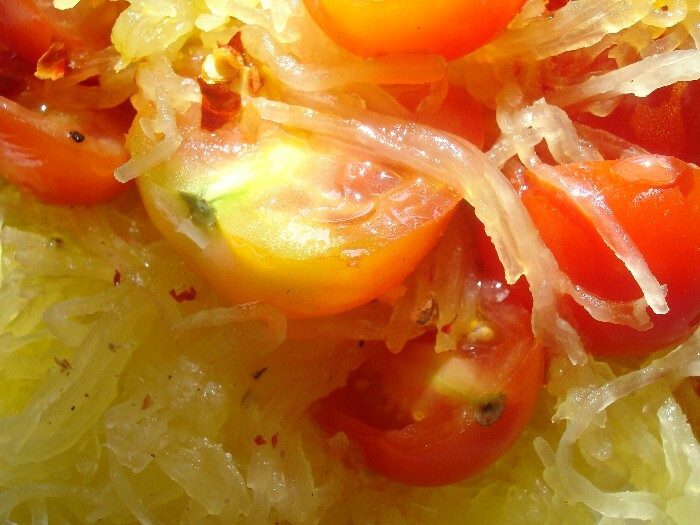 The nutritional information in cooked spaghetti squash pretty much the same as zucchini. In a food processor fitted with an "S" blade, process the walnuts and raisins until the mixture begins sticking together. 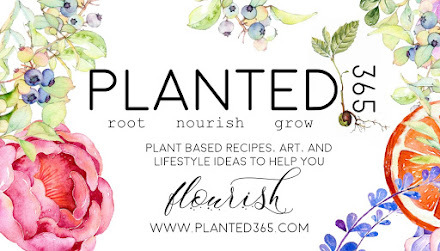 Press into a plate, pie plate, or tart pans and chill for several minutes. 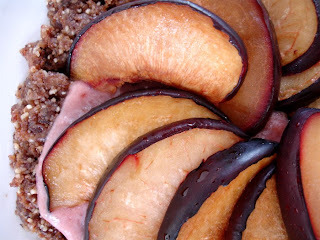 In the food processor, again with the "S" blade, process one plum, the coconut butter, and the coconut nectar. When pureed, spread over the pie crust. Place the plum slices on top. 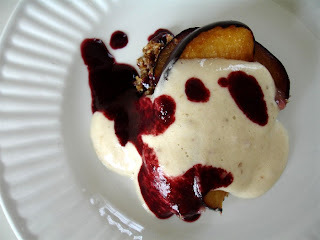 This goes really well with a bit of banana ice cream and a bit of blackberry puree. Yep, this is another repost. A fatally crashed computer wiped out many of my food pics for the week ... and much lovely time spent with kids/grandkids left me little time to take new ones. 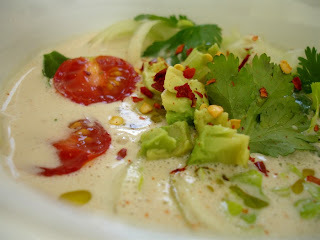 So, I do hope you enjoy these ... the coconut cashew soup is one of my favorites! How do you juggle being busy with trying to be raw and healthy? What is your absolute favorite raw recipe or meal? I didn't recognize it being a repost. Looks really good, especially the dessert. Everything looks great. 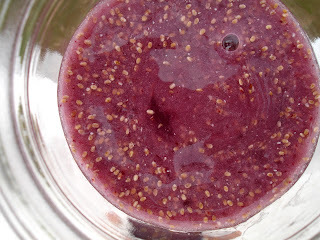 The smoothie looks beautiful - I have yet to try white chia seeds. And that soup gets my mouth watering every time. Okay, the one other time I saw it. :) It just looks so amazing! 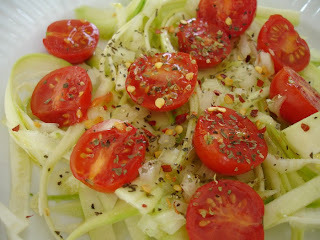 More stellar raw recipes!! Thank you! "How do you juggle being busy with trying to be raw and healthy?" I try to juggle being healthy while being extremely busy w/ 5 children which I educate at home. But the beauty of all this maddness is that they are learning by example and have come to love raw living foods. They support me very much and share all of my raw entrees. 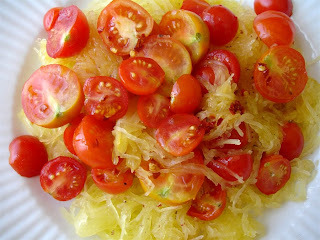 My six year old routinely says, when I creat a new recipe, "Mom you have to put that on your Raw Blog!!" You are eating a lot of fat. lol. Everything looks so yummy! 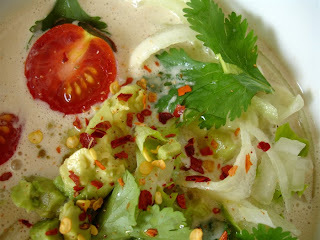 I will have to try the Coconut Cashew Soup. Coconut Cashew Soup looks amazing! I actually was asked this question today. I try to plan my meals for the week. As well, when I get home from the grocery store, I usually wash and cut my veggies and put them in containers. It is simple - apples slices, sprinkled with fresh ground cinnamon and dipped in almond/cashew butter. 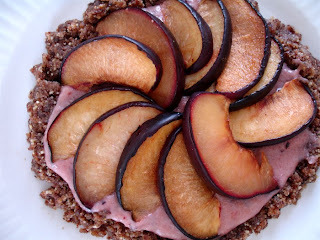 i love spaghetti squash, and your plum pie is so pretty! It's been hard staying raw but I have my green smoothie and salad everyday along with raw snacks then usually cooked veggies in the evening. I just have to stay away from the holiday treats. Were going camping for 10 days so no baked treats for me. My favorite recipes are my green smoothies and banana ice cream. All your recipes are wonderful and I don't remember this as a repost. gosh i love spaghetti squash...yum! 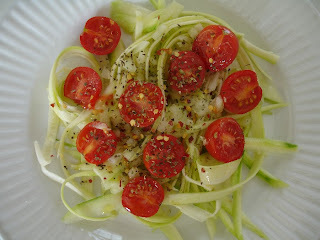 and i'll never tire of zucchini pasta!!! you're always ever so clever and creative! food is like artwork when put in your hands! All of this looks amazing! i have been a lot less raw lately, because of the winter...do you have any tips for raw living in the winter? I've actually been having a hard time keeping up with the raw food recently. At the very least, though, I've been committing to having one green smoothie every day. If I can stick with that through the holiday season, then I'm ahead of where I was last year! P.S. 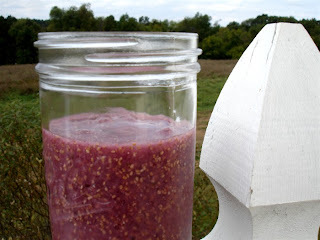 I just made an amazing smoothie yesterday and put the recipe here (http://hannahmoved.wordpress.com/2010/12/11/schools-out/). Cheers! your prices seem kind of off. i'm assuming these are not organic, but even still. the organic nut butters you mention are over $10 ea. are you saying 4 tablespoons =~$2? that's only economical if you eat it everyday till it's done. I was going to say your pics are absolutely beautiful! I can't believe these were the last minute ones. Thank you so much for all your attention to detail.